Last night I had the opportunity to take some of my photo students out to a sagebrush field at the top of campus to photograph the moonrise. It was a Super Moon and very stunning! It was neat to see it come up in the notch of Camelback Mountain, which is to the east of campus. The moving clouds made for additional interesting effects in the sky. Recently, after months of planning with colleagues (Dr. Tom Mitchell and Mr. Robert Breshears) from the photography program at the University of Central Missouri, myself and Idaho State University student John Lowry rendezvoused with our counter-parts at the Badlands National Park in South Dakota. Our primary objective was astro-landscape photography, which involves daytime images of the landscape that transition into night versions with star movement. All total we had seven faculty and students from both institutions. During the last few days of May, we watched temps at the Badlands soar into the upper 90s, with nights dropping into the 50s. The temperature swings made camping an interesting adventure. Besides typical camp life and cold showers, we made numerous trips throughout the Badland region for making traditional photographs (with a mix of vernacular snapshots) of ubiquitous bison and prairie dogs. One afternoon included a trip to the infamous Wall Drug, where snapshots were made of tourists riding the giant jackalope! After three days in the Badlands, we broke camp and struck out for the Black Hills, with stops at Keystone and Mount Rushmore. I found Rushmore disturbing with its extensive commercialization and grand architecture…hmm a potential critical theory paper in the making! Nothing like I experienced back in the 1970s and 1960s. Everything changes with time. The last stop on our photo road trip was Devils Tower, Wyoming. Here I managed to craft an excellent astro-landscape photograph, which transitions from daylight into night with star trails above the Tower. The following day my Missouri compatriots departed to return to the Midwest, while John and I pushed westward. Photo opportunities presented themselves throughout Wyoming, including detailed shooting at the Heart Mountain Relocation Center (Japanese concentration camp) and Yellowstone/Grand Teton National Parks. 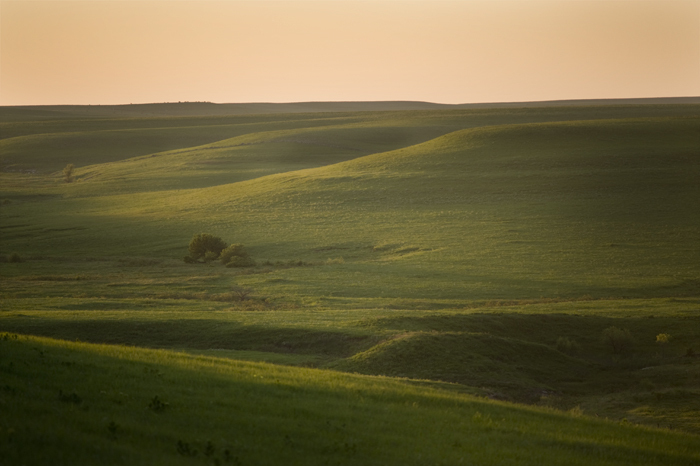 Amazingly, I never tire of photographing the Flint Hills and the Tall Grass Prairie in Kansas. Wilson Hurst and I returned last week, sans students, and set up our base of operations at Emporia. Friday morning we hiked a portion of the prairie that was new to us, the Two Section Pasture, just east of Strong City. Basically it was just a very large pasture with several young beeves, which kept following Wilson! We did encounter one Horny Toad lizard along the trail and that provided some entertainment. After working up an appetite, we headed down to Cottonwood Falls, where we had massive burgers at the Grand Central Hotel. From there, we did a driving tour heading south through Chase County, wondering back roads until arriving at an interesting ghost of a town called Bazaar. 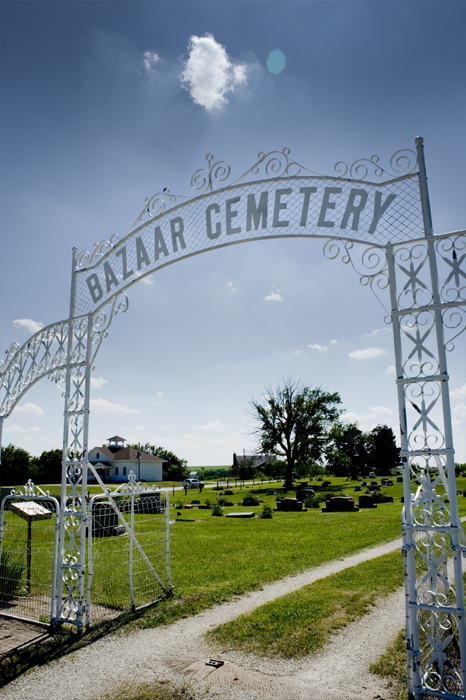 We happened across a unique looking cemetery from the 19th century, aptly named, Bazaar Cemetery. Something about the name just sounds bizarre! Anyway, that was the beginning of a new joint photo project on oddly named cemeteries and the following day we were fortunate to come across two more for the series: Welcome Cemetery and Pleasant Valley Cemetery! What are the odds?! Around dinner time, we headed back into Emporia, checked into our room and then headed to one of the few chain restaurants we’ll eat at while on the road: Montana Mike’s Steakhouse. Fast service, good steaks, and reasonable prices, what else does one need! 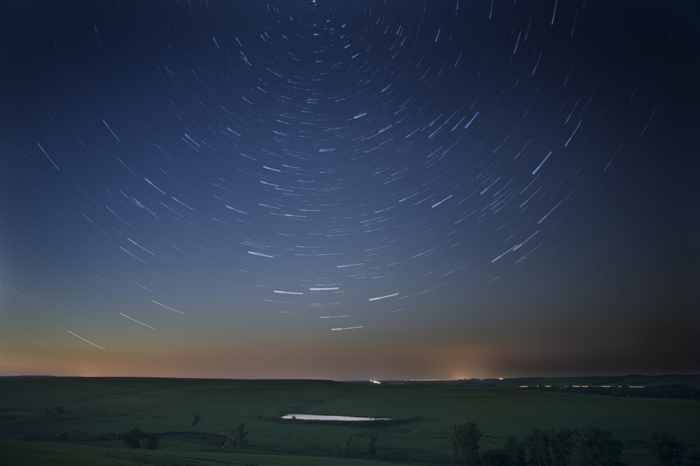 Since the days are getting longer, we decided to go back out to the Tall Grass Prairie to photograph the sunset and to await the night sky for some star trail shooting. Being out in that sea of green at twilight is incredible and we were rewarded with great light, nighthawks, deer, coyotes, Evening Primroses, stars, and an incredible red full moon. It takes patience to do this type of shooting, something my students struggle with; but we were there in one spot from 7:30pm until almost 10:30pm, before calling it a day. The next day started with a great breakfast at the Flint Hills Restaurant and then we headed north for the Konza Prairie. En route, we detoured off the highway and found Pillsbury Crossing and spent time photographing the waterfalls at the fording in Deep Creek. While there, we spotted what appeared to be a Cottonmouth snake, sunning itself on a flat stone in the river, not far from where we had been shooting. Then we were off to the Konza. Springtime flowers were abundant and we captured several images along the trail up to the summit of the ridge. Although we covered a lot of miles in two days, it was incredibly relaxing and great to get away from urban life. 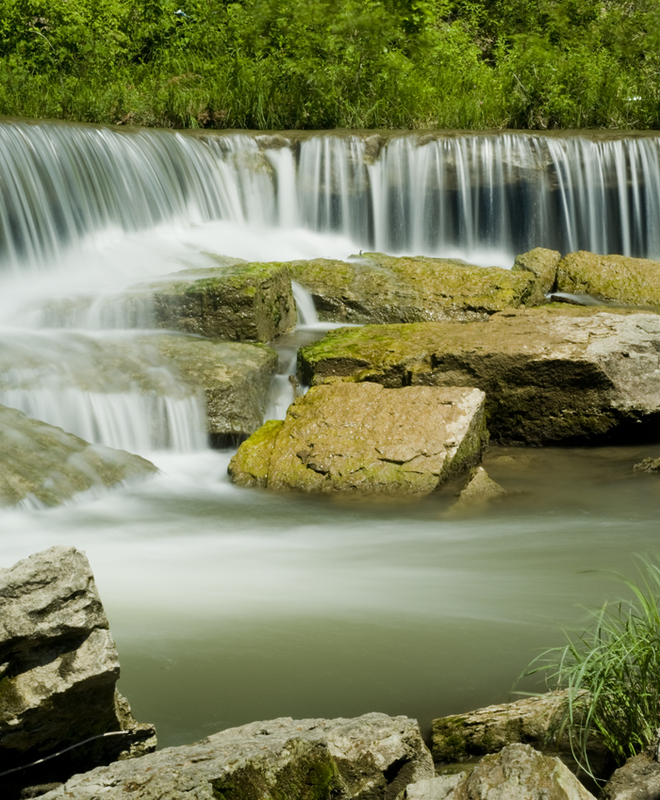 Great photography, great food, and great landscapes: the Flint Hills is my favorite for all of these! 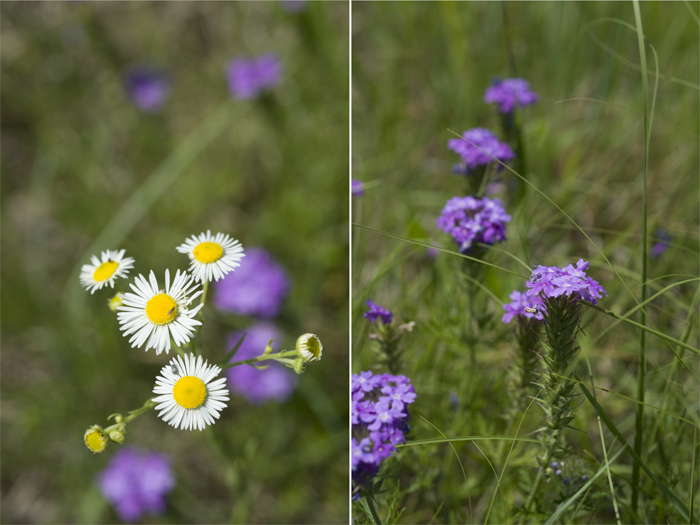 © 2010 Terry Ownby, Annual Fleabane, Erigeron annuus L. & Blue Hearts, Buchnera americana L.